Removal of the grille comes with having to change the bulbs on your sidemarker lights, helping to gain clearance for a modification, or simply for the OCD owner who likes to keep their machine clean. Whatever your purpose for the grille removal, its a relatively simple task with minimal tools required. *Note - These instructions apply only to the 1 piece style grille like shown in the above image. There are 8 (eight) "T-15" torque screws accesable from the front, and 2 (two) bolts from the bottom. Begin by lifting the hood, at start with the 4 (four) top torx screws on the top section of the grille. There are 2 (two) screws on each side of the radiator. With the 8 (eight) torx head screws now removed, it's time to figure out if you have 2 (two) more bolts to remove. If you bought your truck used, chances are the 2 (two) bolts that hold the bottom of the grille on are already removed (and long gone). Gently tug at the grill to access if it seems to still be attached at the bottom corners. Try to rotate the top out, and the bottom back to clear the grill from behind the cladding. If the grille comes forward and out, it is unbolted! If it does not want to move, there are 2 more bolts attached to the grill. 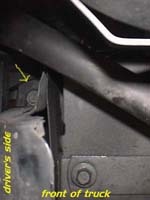 Skip this step if the 2 (two) lower grille bolts where already out - Getting under the front of the truck, (you may have to use jackstands for clearance) there is a square "pocket" on each side of the grille where the bolt is hiding. Look near the side cladding, upwards in front of the large diameter support beam that crosses diagonally. Remove this bolt, and the grill will be free to wiggle out from behind the cladding. With all the bolts removed and before you can fully pull the grille off the truck, you must remove the sidemarker lights from the corner lenses. Rotate each bulb harness out from the lens, and the grill is fully unbolted and free. To re-install the grille, reverse the steps above. For those who had to remove the 2 (two) lower bolts underneath the truck, you have the option of leaving these out. Not having them in will NOT affect the grille mounting or risk having it falling out (there are 8 other bolts holding it on nice and tight) and you will be thankful for the next time you have to remove the grille and dont have to get on your back on the ground.